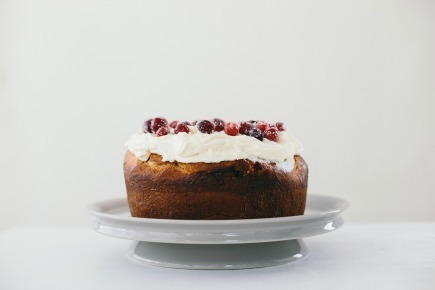 This will make more cranberries than needed. I like to make extra to add to other baking, or just to nibble on. Combine the water, sugar, and salt in a medium sauce pan over medium-high heat. Bring to a gentle boil and then reduce the heat to medium; let simmer until the mixture is reduced slightly, 5-7 minutes. Pour the vanilla into the sugar liquid and stir to combine. Pour the cranberries into the sugar liquid and let them soak for at least 8 hours and up to 24. After the cranberries have soaked, place the remaining 1 cup (198g) of sugar in a bowl. Line a sheet pan with parchment paper. Use a slotted spoon to remove some of the cranberries from the liquid, and coat them in the remaining sugar. Place them on the sheet pan and let them dry. Place the dough on a lightly floured surface and knead a few times. Let the dough come to room temperature, and then roll the dough into a 1/4 inch thick rectangle. Brush the entire surface of dough with the melted butter, and spread the orange-sugar mixture evenly over the butter. 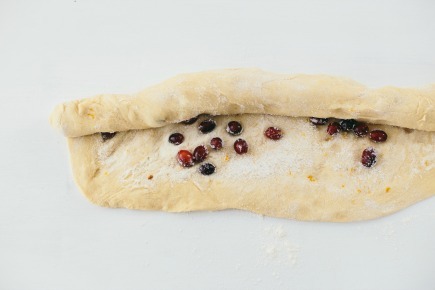 Scatter the cranberries over the dough, and gently press them down into it. Roll up the dough, starting at the long end. 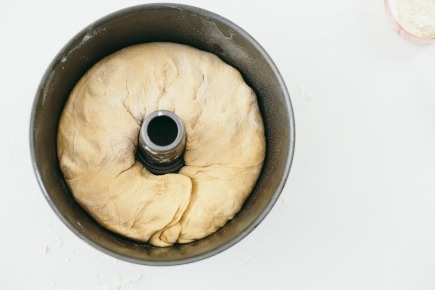 Grease a 10-inch tube pan, and gently place the dough inside it, with the two ends touching. Let the brioche rise in the pan for 1 hour. Preheat the oven to 350. Bake the brioche for 45-50 minutes, until golden brown. Let the brioche cool in the pan for 20 minutes, then carefully remove it. Let it finish cooling on a wire rack. 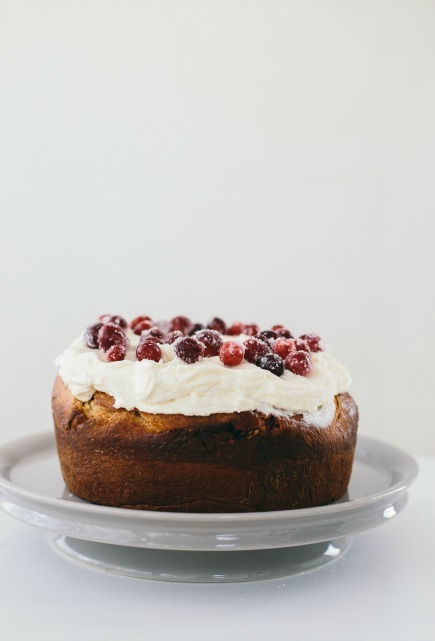 When the cake is completely cool, top it with the cream cheese frosting (recipe follows) and sugared cranberries. Best eaten the same day it is made. In the bowl of a standing mixer, beat the butter on medium until smooth. Add the cream cheese, and beat again until light. Scrape down the sides and add the triple sec, vanilla, and salt, and mix on low until combined. Add the powdered sugar and mix on low until combined, then increase the speed to medium and beat until light and fluffy. Hi Zoe/Jeff! 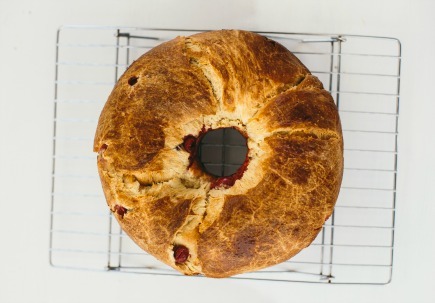 I have a question about the original master boule recipe in your first book. I keep getting a skin on my dough. Sometimes it doesn’t form until it’s been refrigerated, and sometimes it forms during the initial rise. I tried reducing the flour to make it wetter, but I got a skin and ended up with wetter than preferred dough. I’ve tried covering the dough directly with a loose piece of saran wrap. I’ve tried covering the bowl completely and tightly. I’ve done it the way you recommend. Any ideas? I weigh all of my ingredients and I’ve been making your bread for years. Thank you! If you store dough, there’ll be some skin. But what’s the consequence of that?–we don’t find any problem with it, so long as it doesn’t get dry and hard. I recently bought AB in 5 and HB in 5 and love both books. Experimented with various renditions of the master recipe and the master challah. However, I have a question that resulted from my first attempt at the brioche dough. Made it yesterday and it’s been in fridge. When I went to use it in your “Barrymore Pletzel”, it was incredibly sticky and difficult to work with. I had to dust it and my hands lightly with flour, but still really sticky. Is this normal? You can always decrease the water a bit, couple tablespoons at a time. My daughter has kidney disease and has been advised to follow a low-protein diet. Apparently there are low-protein flours on the market. Have you tried these with your recipes? Any suggestions? 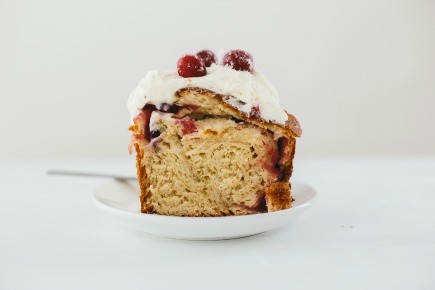 Have not–the concern is that lower-protein (gluten) means less rise… Like pastry or cake flour. But we haven’t tried those.